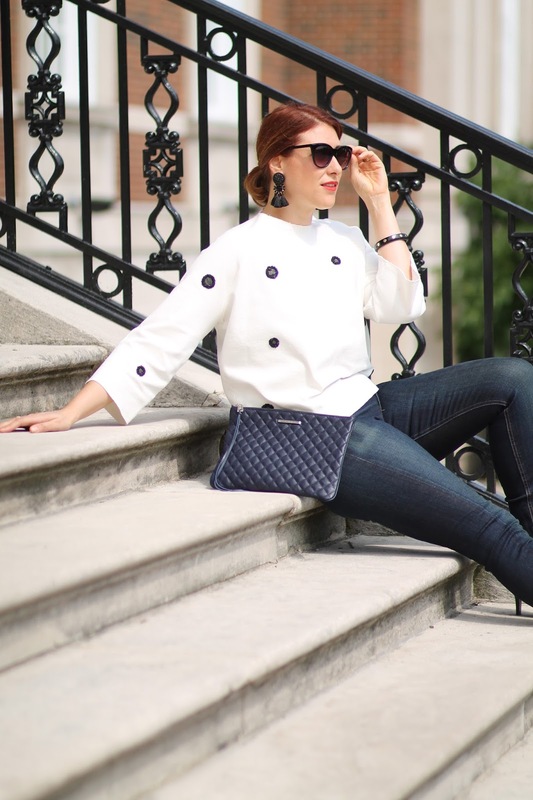 Doesn't this little white bomber jacket look super luxe? I have my Nordstrom Rack aficionado friend to thank for it. I was spending some time doing some summer shopping with my friend Olivia at her favorite store, The Rack, and we both found this jacket and tried it on. I think she totally should have gotten it too but she changed her mind. She is always free to borrow mine though. Sometimes you need a friend to push you into different stores otherwise you can get caught in a shopping rut. I find myself always gravitating towards the same few stores, Zara, Forever 21 and H&M but she helps me bring out that inner sale digger that I'm usually not. In the end it brought me to this cute jacket for under $40 bucks and a few cute underthings that were pretty darn affordable too. What stores have you been branching out to lately. I'm recently in a bit of a love affair with Athleta (sorry Lululemon) because they have such comfy and affordable pieces like this dress I got for my back to school wardrobe and this long sleeve work out top in the prettiest shade of lavender. 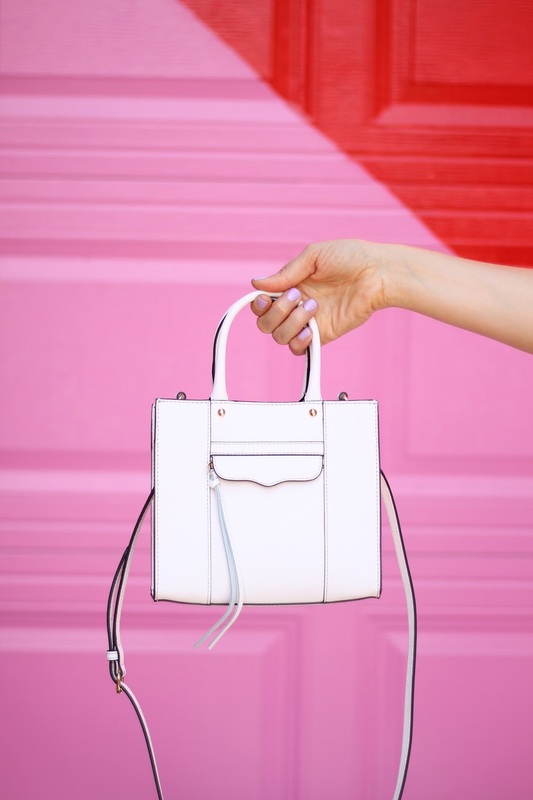 You may have noticed since this bag shows up in so many of my posts, but this Rebecca Minkoff Mini MAB tote is my favorite summer bag by far. It's great for running out the door to just hold a few things but it also somehow, almost magically holds my entire camera! I can't say enough good things about this MAB bag. I have the bigger tote version for the school year and it was the perfect investment piece to feeling pulled together when going off to school carrying a million things! 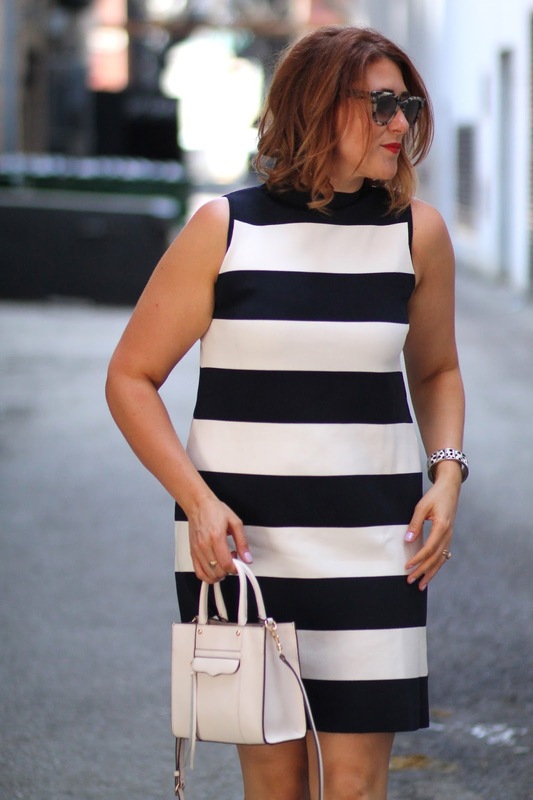 You can usually find both sizes on sale (this mini is and this medium tote are on sale) at the end of each season so I recommend going for a nice neutral color to work with all outfits and occasions. 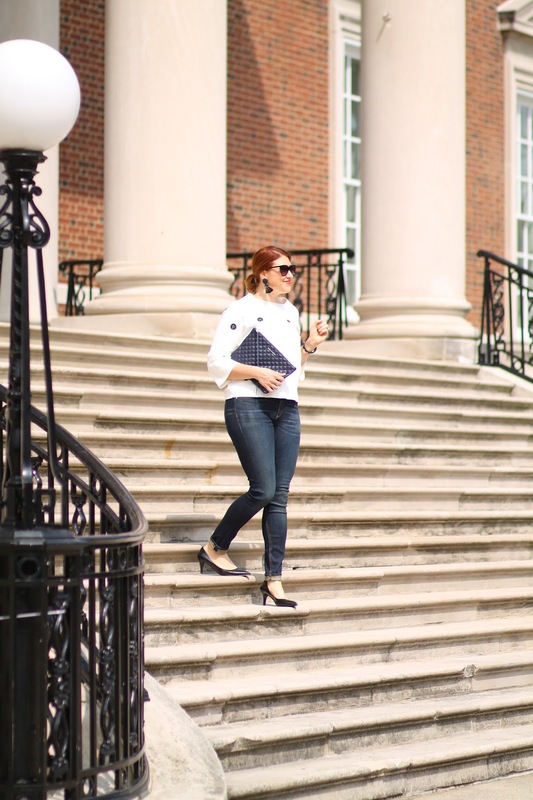 Top: Zara (love this similar one) // Jeans: Rag and Bone (on sale!) 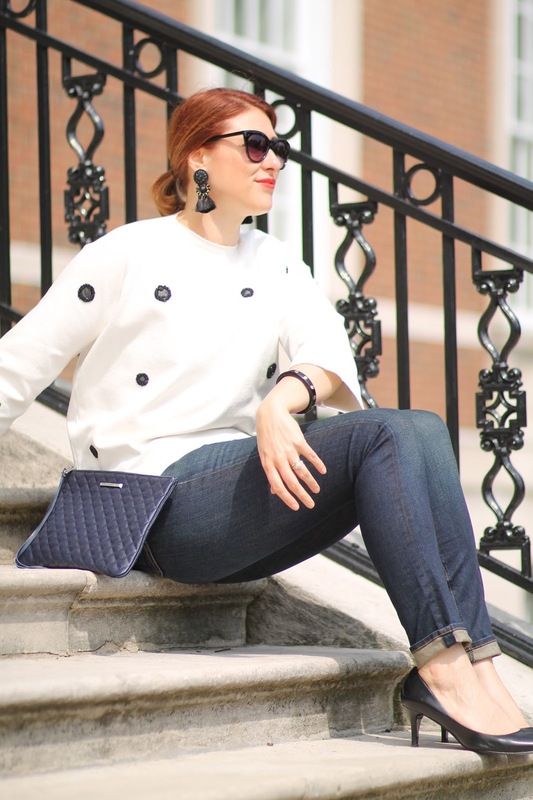 c/o Shopbop // Bag: Rebecca Minkoff // Earrings: H&M // Heels: Nine West // Lips: Nars "Heatwave"
This is my version of a little Fall preview even though I wore this outfit in the early parts of the summer since it was so chilly back then. Remember that? It was only a few weeks ago and we are headed right back to those temps soon. 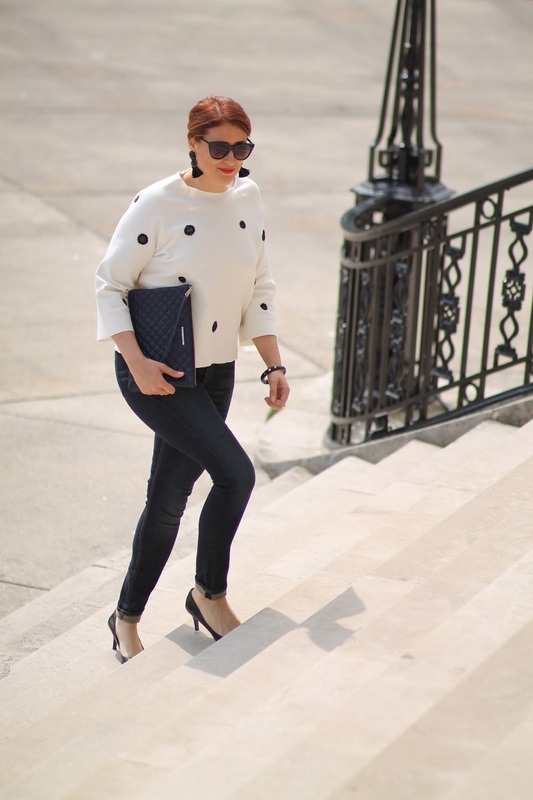 This sweatshirt was a steal from the Zara sale earlier this summer so I'm sorry to say, it's no longer available. But if you're feeling splurgy, there is always this one. This bag was a free gift with purchase at the incredible Rebecca Minkoff store in Soho. Has anyone been there? It's so cool how the mirrors detect the products you're holding and displays them on screen in the fitting rooms so you can virtually try on the other colors. You can even order up a drink from the store mirrors and try out different types of lighting! So cool. By far the most high-tech fashion related store I have ever been in. It's like the Apple store and purses had a baby. You must visit next time you're in NYC! Thanks to Lauren for the photos. 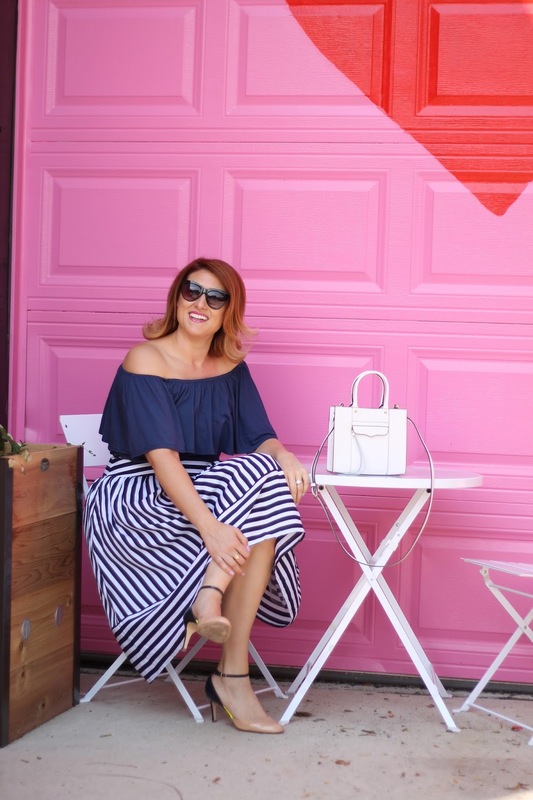 Shop the post right here! 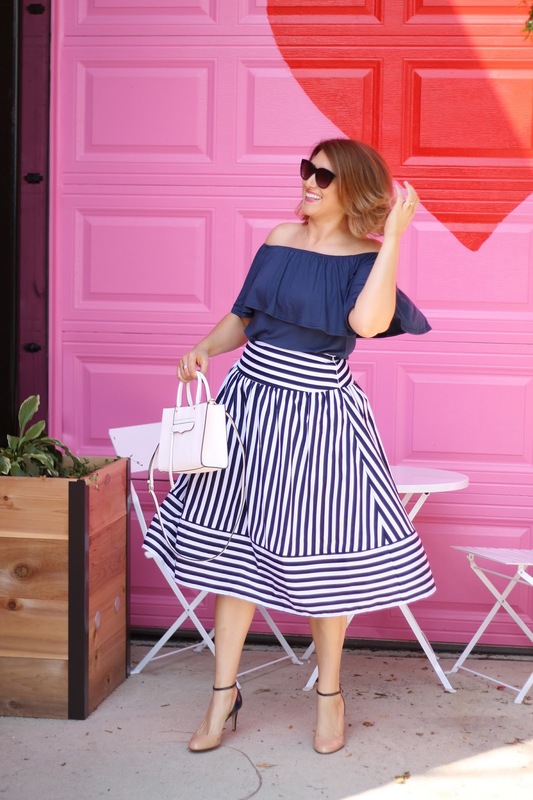 A midi skirt and off the shoulder top make for the perfect little retro summer pair. In case you couldn't notice by my outfit choice, my husband and I have been rewatching a whole lot of Mad Men seasons. I think after seeing all of Betty's full skirts, this one (this years version of mine) was calling out to me. Not to mention I had just gotten my hair cut and it was doing this perfect retro flip. 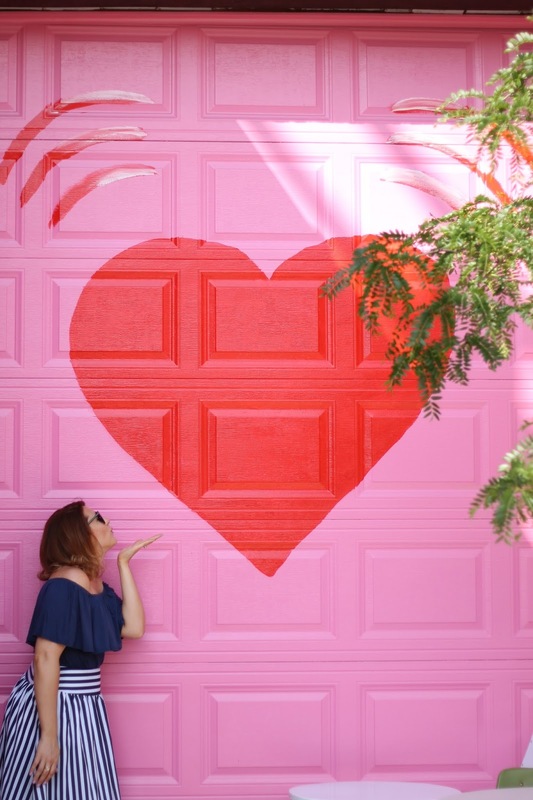 Thanks to Lauren and Arin for going on this field trip to this amazing heart wall I discovered months ago but was always either alone or in workout clothes whenever I went past it. Not very conducive to blog photos. Summer for me is a perfect time to say yes to some daytime fun that I wouldn't usually be able to participate in when teaching. 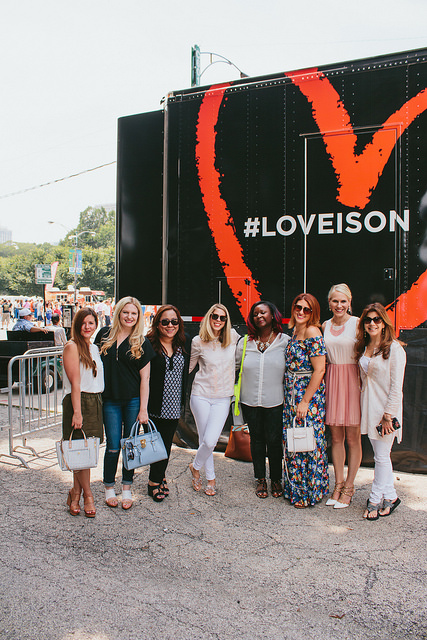 I'm so happy I had the chance to say yes to spending a super fun Afternoon with with the hosts of Chicagonista Live, some pretty amazing Chicago bloggers, and Revlon, at the #Loveison Pop-up Shop at the Taste of Chicago! 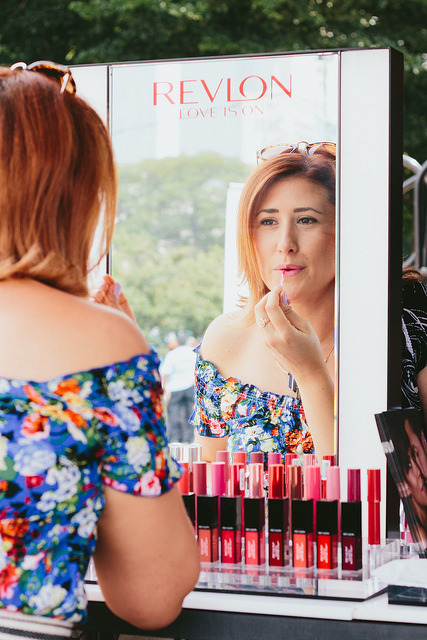 Usually the Taste is all about eating, but on this particular day it was all about the latest beauty trends for Summer and Fall from Revlon. Whatever look you were going for, the makeup artist at Revlon were ready to help you achieve it! 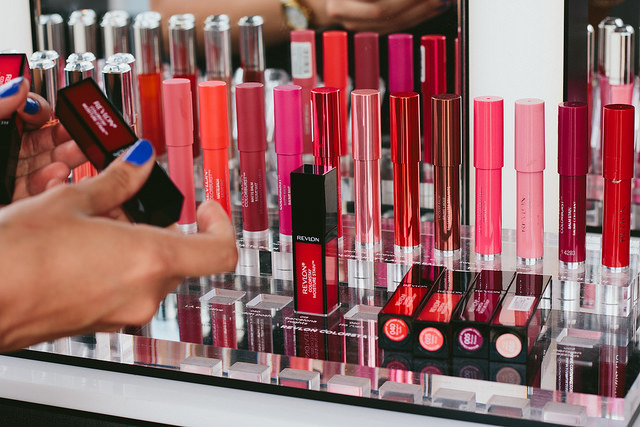 And if you had no one look in mind is was also just as fun to play with the amazing selection of lip glosses and lipstick colors. Seriously, there was so much there it was impossible to try just one. Naturally, I gravitated towards shades of hot pink (this was my favorite) but it was this bright red Ultra HD lipstick that has turned out to be my summer favorite, mostly because of its balm-like texture (it's a wax-free gel formula so it feels light as air) and intense pigment. Did I mention is smells like strawberry too? Yum! Did you know that Walgreens carries tons of Revlon Products, and that from August 16th-22nd you can score all your favorite Revlon products at some great prices? Get your face back-to-school ready! 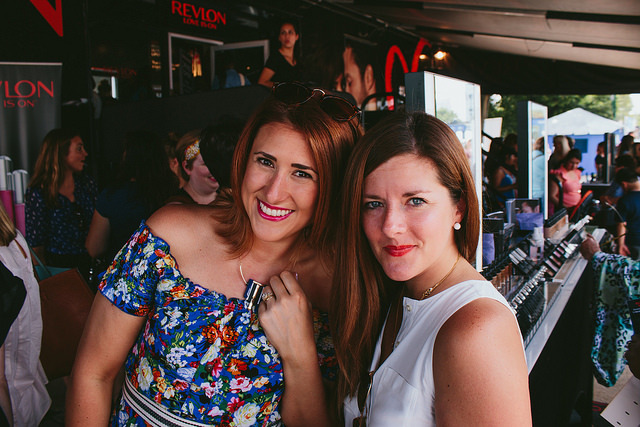 Press play to get a fun look at the video we shot the afternoon of the Revlon pop-up shop! 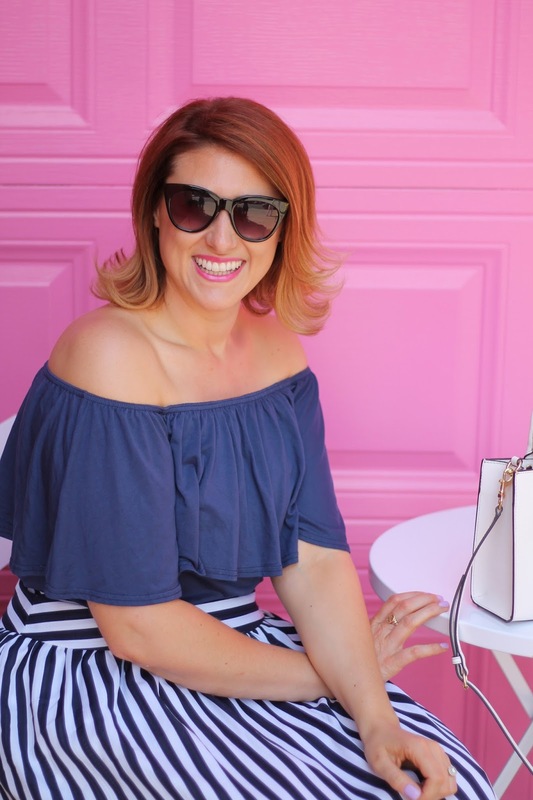 Staying cool in the shade with the lovely Anna. I must own about a dozen of these color sticks. My favorite one is Smiitten, a pink balm stain that lasts forever! 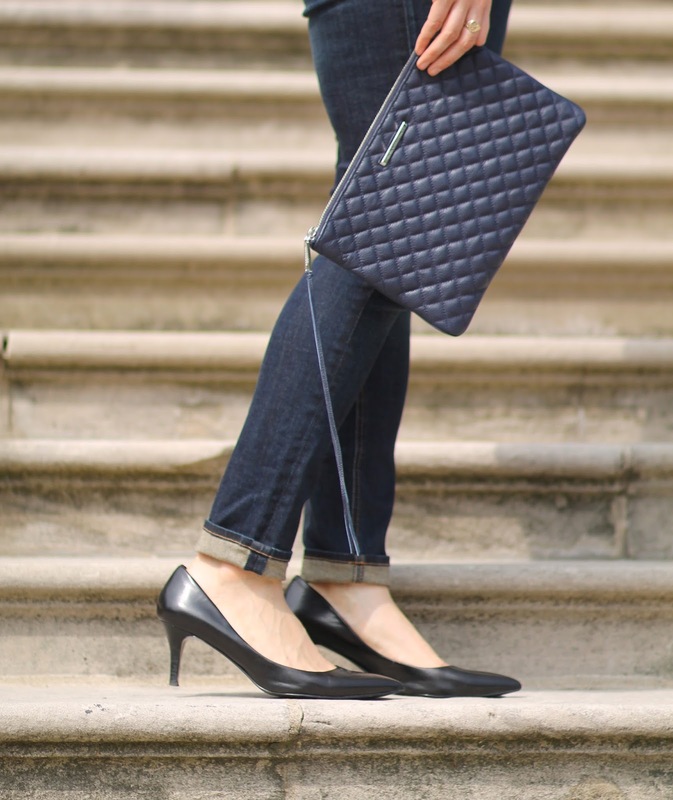 So easy to throw in your purse and apply on the go. Trying out my new favorite shade of Ultra HD gloss. My time in front of the camera! 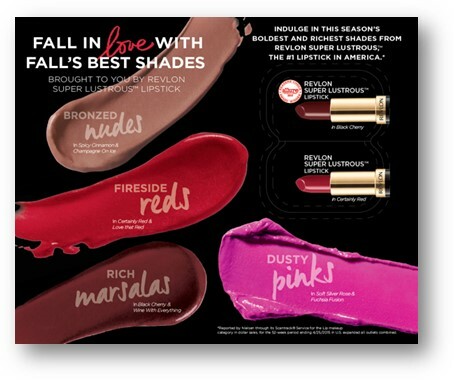 Here's all you need to know about picking the right shade for Fall! These four color palettes are your Fall go-tos! Thanks to Chicagonista Live for the video and photos, Revlon for the amazing products and Walgreens for the killer deals!